~*~ Oman Sky * ســمــا عُـــمـان ~*~: "Gospel of Barnabas"
نظرات في إنجيل برنابا المبشر بــ نبؤه النبي محمد صلى الله علية و سلم. عموماً هو يحمل بعض النصوص من إنجيل بارناباس و التي ترتكز على 3 محاور مهمة: وحدانية الله ، عدم الصلب ، ونبؤه النبي محمد صلى الله عليه و سلم. 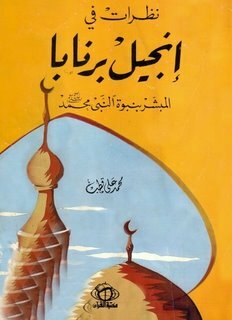 مع أن الكتاب موجود بالمكتبة منذ زمن لكني لم أركز عليه بصدق ...فقط الآن قررت أن القي نظرة خاطفة لمحتواها و قصته. 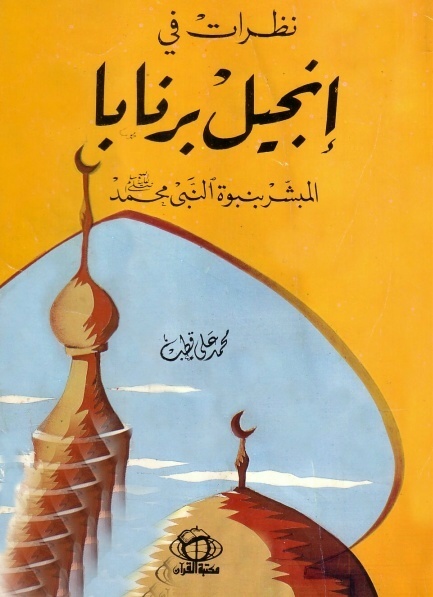 الكتاب طبعاً يؤيد هذا الإنجيل و انه صحيح مع كثير من الاستعراض و الشرح و التأكيدات. وبما أني لم اقرأ بقية الأناجيل لأحكم لكني أتفق معه في بعض النقاط التي نعرفها كمسلمين. في نظرتي البسيطة المتواضعة أقول لربما هو ليس متقن و به بعض الأخطاء ولربما مسألة الترجمات هي ما زاد من ضياع بعض معانية الأصلية ، لكن ألا تحمل بقية الأناجيل من التحريف ما يكفيها! ، ومن جهة أخرى اعتبره جيد كونه يقدم بعض الحقائق بشكل صحيح. What happened that I found a book in my uncle library about the Gospel of Barnabas and how it's announcing the prophecy of Prophet Mohammed. I read it and it was really interesting… there were few texts of this Gospel and the main topics are: the oneness of One God, the refutation of crucifixion and the prophecy of Prophet Mohammed. But there were other interesting topics as well. I went also searching in Arabic to see my dear Arab Christians and what they say. Wow, they are more opposed to this gospel than westerners as I found out. Most of the links attacking this gospel and falsify it. One of these link "in Arabic of course" claiming to have 50 evidences prove that this Gospel is fictitious and spurious. Well, I read them and to be honest…they have good points in some, but other ones are not real to me, besides, I didn't read the other bibles to know the differences!. Anyways, I think it's good and despite some of its unreal facts, still has real facts and reasonable. Aren't the other gospels got same distortions?! Now, what do you think about all this? Don't be mad if I don't comment on this a lot, okay? It's interesting though that you read what Christian Arabs are saying. Where did you find that? That's what I was afraid of when I was thinking not to write here about this book, but put it only in my other blog. I didn't mean to create any division between us. It's a book I found made me thinking. Also, this Gospel has been found by westerners and has been translated to English by them and then an Christian Arab translated to Arabic in 1908. I wanted to see what Christians say in the west and in the east say about this Gospel. So, I found the eastern Christians are more opposed. As for Christian Arabs I just searched in Google by using the Arabic words of this Gospel, and the links mostly seems to be attacking this Gospel. Anyways, I didn't mean anything wrong. I thought maybe we could discuss about it… one of you can give us clear idea about that. We could find new facts, new truth, we should try to learn …try to see and use our minds. In the book here I found in the last page a question, the Christians fast in the day before the Easter…right. WHY? Because they do what Jesus did and fast like him, but why Jesus fasted?!!! . there was no answer…so WHY? PS: I could write this only in Arabic and discuss with Arabs only, but I thought I can't ignore other readers and exclude them. Sorry if I made you sad and mad with me, I didn't mean anything but peaceful dialogue with readers. Anyway, I will never write here about religious topics never ever again except my own religion. All these things will be in my other blog. Where is your other blog Sama dear? You misunderstood me, I promise! I never was mad; not even a little bit! I promise! I am very American, I always say exactly what I feel. If I am mad, I say, "Guess what? I am mad!" You never have to wonder what I am secretly feeling---just read the surface and you get the complete answer! You got it backwards. I was afraid that if I tried to answer your question I might make YOU mad at ME! And I was also afraid that I might disappoint you if I didn't answer. I'll tell you one secret: It's very hard to make me mad! I never felt even irritated with you, not once! So, tomorrow, I will come back and try to answer your questions the best way I know how...but promise to be gentle with me if I say something wrong, okay? Like I said before, you didn't make any mistake at all. It's a good post and very good question. We are friends, we don't fight over silly things, do we? One day, if you hear my voice, you will see what kind of person I am. I am easygoing and friendly about these things. It's just that I like to argue and I sometimes hurt people by mistake. See? You understand? You believe me? I'm sad now because I didn't want to hurt your feelings; that's the last thing I wanted! Christians have four Gospels in our Bible: Matthew, Mark, Luke, and John. (The only one I know how to say in Arabic is 'John', which is 'Yahya.') All Christians--Catholics, Orthodox and Protestants--accept all four and only these four Gospels. There are other writings called 'Gospels,' that are not accepted by Christians. Not just Barnabas, but also Thomas and even Judas. Long before Mohammed's time, the decision to accept these four only was made by all of our Fathers. The rejected Gospels usually have a lot of 'magic'--one of them has Jesus as a boy killing another boy who touched him by mistake! Most of them are what we call "Gnostic". That means they have the idea that people's bodies are evil and the world is just a dream created by the Devil and we need to escape from our bodies--things like that. So all these Gospels are rejected because this Gnostic idea is not a Christian idea. Christians believe that the body and the world are good and were created by God, even though they are infected by sin. Now, you asked, "Don't the other Gospels have distortions"? Of course, some people think so, but not Christians! They are like the Quran for us, we accept that they are the Word of God and they tell the Truth. Fasting before Easter? We do some fasting and other things before Easter, but not the DAY before Easter. It's the FORTY DAYS before Easter. That's called "Lent." We do penance in general during Lent, not just fasting. The thing you would notice among us is that we choose to give something up. For example, I might give up my computer for Lent except emergencies. Or I might give up all reading for fun. Or I might give up TV. Or I might pray for an hour on my knees. Things like that. And every Friday of Lent, Catholics don't eat meat. Lent starts on Wednesday, we call it "Ash Wednesday." Catholics go to Mass and the priest puts ashes on our forehead in the sign of the Cross and he says, "Remember, Man, that you are Dust and to Dust you will return." This reminds us that we will die and that the only important thing is to try to serve God. On this day we fast. I usually try to eat nothing, even water, for twenty-four hours. We also fast on Good Friday. That's TWO days before Easter. It's the day Christ died. Easter, if you didn't know, is the day he rose from the dead, as we believe. The forty days is for two reasons. First, because it's a time to prepare and purify ourselves before Easter. It's a little bit like Ramadan and then Eid at the end. But the forty days comes from Christ's fasting in the wilderness. The Bible tells us that Jesus lived at home for many years subject to his mother and step-father, Mary and Joseph. Then, he began his public ministry of teaching and doing miracles. But before he started the public ministry, he went out into the desert and fasted and prayed alone for forty days to prepare. So we take the forty days to imitate Christ's fast and we prepare for Easter like he prepared for his public ministry. And then...an explosion of Light and Joy! Easter and "Alleluia, He is Risen!" and Death is Killed Forever. Even thinking of it now, I have tears on my face. Now, my comment is long and maybe too much information! But I tried to do what you asked. If it's not right or if anything bothers you, please forgive me, Sama. I didn't mean it. I just tried to show you how it looks and feels for a Christian, that's all, to use my mind and my heart. Nash: That's what I meant, Hope Layal came and saw this post as she drove me to put it here not THERE. LOOL ….as for THERE, I can't tell what is my other Blog *~*….it's a big secret. Go back and see my 3rd post here and you will understand WHY?. As for your answer, it's superb. It's really good and I know the names of the 4 gospels. As for the Arabic names, I know Matthew= Mata, Luke=Looqa , there are other words like Maraqas maybe for Mark and Yohana maybe for John. Well, I don't think John=Yahya as I know Yahya=Jonathan. That's what I know….!! I liked your explanation about the "Gnostic"…I never knew about this!! So weird indeed. No wonder then to reject such fables like that. Yes, this word "Lent" is for the big fast that you do. Really interesting things you do and again I never knew things like that. So interesting. Yes, I was thinking exactly that you are having your own Ramadan time. so COOL. Oh, Jeff…my DEAR. I really enjoyed reading what you have gave me. I really imagined each thing you wrote. Thank you so much for giving me this opportunity to see and feel the Christians religious rituals. It was really wonderful. Here is a panorama of my church in Washington DC on Ascension Day. It was in the Washington Post newspaper. You probably saw panoramas before, but if you didn't, you have to wait for it to load and then you can move it all around with your mouse and see the picture from every angle. Make sure to turn your speakers on when the panorama finishes loading and you will hear the amazing singing we had that day! You might have to sign up as a user for the Washington Post, but it's free. Thanks for the info on the names, too. But what did you mean that you learned how to get along with people of different religions "there." What do you mean "there"? Did you spend time abroad in the West or something? Or just online discussions? Jeff. How could you make me mad…I really enjoyed knowing all these explanations. Nice to increase my knowledge about other religions. I downloaded the panorama file to my PC and I watched this gorgeous church with the charming singing. I even gave my brothers this panorama to see. One of them was amazed and he joked with me: what is the big idea? Why you are so interested on Christianity? Are you planning to convert or what?!!! But I'm fascinated by religions and I love to see the ART of the churches. I saw wonderful paintings on TV and magazines from churches. That was really COOL. As for the singing. It was really touching…but to be honest, I love to the way of their singing, while I'm not sure what they are saying!! Verses from the bible! Can you give me the text to try follow them and see. It's so nice indeed. I have another silly question to you. As I watched on TV many times, I saw the priest giving the people in church like a white thing into their mouths. What is that thing??!!!! I'm glad you enjoyed it, Sama! Very glad. I'm proud of my church, it is beautiful, isn't it? Usually, we sit in the front of the church and I could tell you, "Look there that is us in the front, sitting," because you could see us in the panorama. The music is just a little piece of one song that they play over and over. It starts in the beginning of a sentence. It's in Latin and it goes, "...et Apostolicam Ecclesiam. Confiteor unum baptisma in remissionem peccatorum. Et exspecto resurrectionem mortuorum. Et vitam venturi sæculi. Amen"
In English, it means, "...and Apostolic Church. I confess one baptism for the forgiveness of sins. I look for the resurrection of the dead. And the life of the world to come. Amen." This is from our big statement of our beliefs (a Creed) we say on Sunday. On a big feast day, we sing it! It starts like this, "I believe in One God, the Father Almighty, Maker of Heaven and Earth, of everything visible and invisible..." But that part isn't in the music you can hear. Your question? What is the white thing? Oh my God, Sama, this isn't a dumb question. Huge books have been written about what is that white thing, so don't feel dumb! Now, how do Catholics understand this? How can I explain it? Let me tell you two stories from the Bible as an introduction. It's just the surface, just a taste, not a complete explanation. "I am the Bread of Life. I am the Living Bread which came down from Heaven. If any man eats of this Bread, he will live forever. And the Bread that I give is my Body; I give it for the life of the World." And his followers said, "Whaaaaaat? How can this man give us his Body to eat?" And Jesus said, "Truly, Truly, I say to you, if you don't eat my Body and drink my Blood, you won't have Life in you. My Body is real Food and My Blood is real Drink. If you eat My Body and drink My Blood, you will live in Me and I will live in you." And his followers said, "This is crazy talk, who could possibly believe it?" And most of them went away and left him from that day. But he asked Peter, the leader of the Twelve Apostles, "Will you also go away?" And Peter, who also didn't understand any of what Jesus said, replied, "Lord, who can we go to? You have the words of Eternal Life." Then, some time afterward, it was three days before Easter. It was time for the Passover feast and Jesus and the Apostles went to eat it a certain room in al-Quds. And after the meal, Jesus took bread, and He blessed it, and He broke it, and He gave it to them. And he said, "Take this all of you and eat it. This is my Body, which will be given up for you." Then He took the cup, filled with wine, and He said, "Take this all of you and drink from it. This is the Cup of My Blood, the Blood of the New and Eternal Covenant. It will be shed for you and for many so that sins may be forgiven. Whenever you do what I am doing now, remember me." 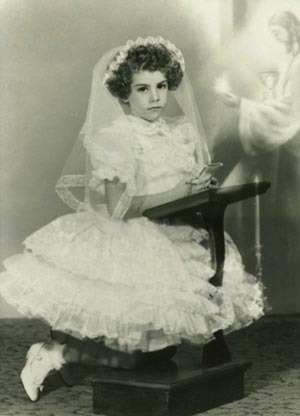 Little Girl--Her First Communion!--And a New White Communion Dress! Sorry! Too long. Too confusing. Too strange. But I did my best. For some reason two of the links don't work. You are welcome Layal! Can you or someone else tell me what the Arabic part of your comment says? I've been in church before. I liked the story of Jesus and the followers. I understood immediately what he meant by his words… it was a figurative expression. He meant they should share what they have even if it is so little and be giving and modest. Therefore, when he ate with Apostles, he divided the bread and the drink to share it and want them to share and be giving people. Well, not only in food and drink, "and not specifically wine", but with all things that can be shared and can help others and gather all people under one roof…the roof of brotherhood. So, that white thing called "Communion Wafer". Lovely!! Thank you for the picture…I liked them so much…I love Pope John Paul II….I really did. Well, the new one is not that charming and COOL as him, but maybe he will be as good as the ex-pope! I remember once I wanted to visit an educational site and it was blocking by them…What The… !!??? NO, I didn't sent any e-mail to them about that…I wasn't care that much to contact them. Well, at least…I saw all the pictures you gave me and I saved them in my PC. Layal: thank you...coz you pushed me to put it here, not in my other islamic blog. but where is this church that you visit????? your english is so good and don't be shame to try and write. by that you will learn and know your mistakes. But we never hear about it; the last time was when the Princess ran away with the soldier! It's a small country, but an ancient culture, something precious like a pearl. At least, I think so. The sweetest of the small Gulf sheikhdoms. We don't think Jesus was speaking figuratively at all. All the ancient Churches of the West and the East don't think that at all. Thomas Aquinas, our great philosopher said: "For this the truth does not come through the eyes or the taste, but through the ears, through hearing the Truth." In the Bible, St. Paul says when you approach for communion, you have to recognize the Lord, or you are doing something bad. And we point out that if Jesus only meant what he said as a symbol, then His followers would not have gone away! Or he could have explained it to them. 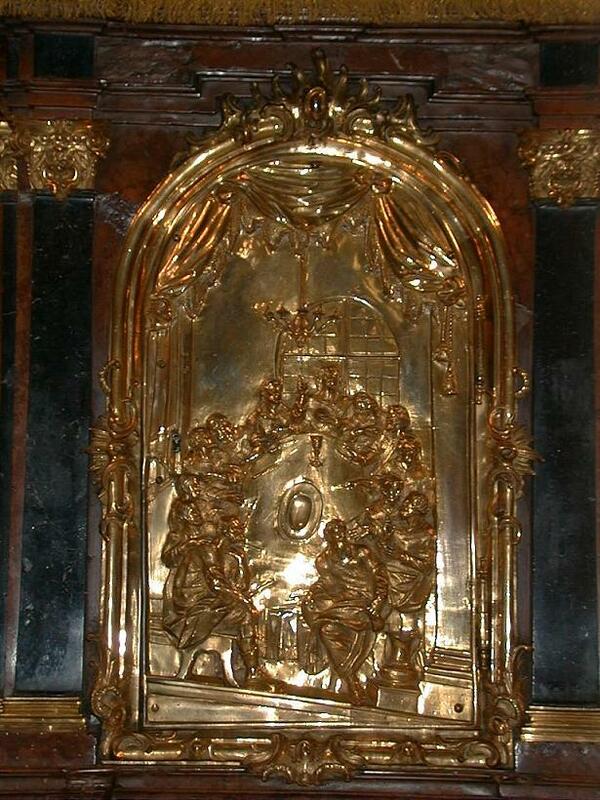 I will put a couple of links later for the tabernacle and the tabernacle lamp and also for the music for Pange Lingua Gloriosi, and then leave it unless you want to ask or say more. Okay, let me give a better answer to "What is the white thing" for Catholics, now that you have the background. We believe that under the appearance of bread, we receive Christ. Not pieces of Him, but all of Him. 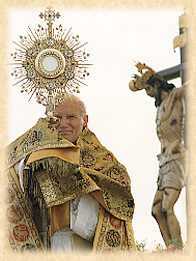 The way we say it is, "Under the appearance of bread, we receive the whole Christ, Body and Blood, Soul and Divinity." 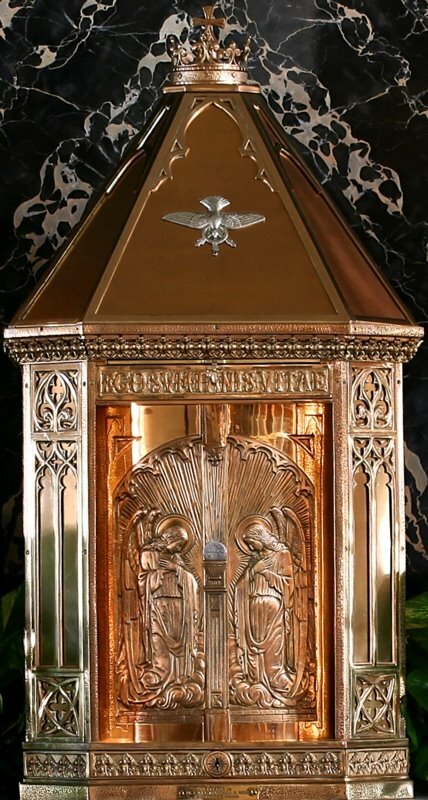 So, when we finish Mass, if any "white things" (we call them "Hosts") are left over, we put them in something called a "tabernacle", like a beautiful box. And we light a candle, in red glass, usually hanging from the ceiling, to show that Christ is present in the tabernacle. And since you are curious about religious rituals and watching videos online, this one is wonderful. Left click on the little screen and make it big. And turn on your speakers so you can listen. It's the Installation Mass for Pope Benedict in Rome. It's long, you can just watch a bit, if you are curious. I don't know anything about the Protestants or their churches, but what is the different between the churches??!!. Yes, so lovely site, despite the page of information about Islam is under construction…but still nice. utilizing? I'm experiencing some small security problems with my latest website and I would like to find something more safeguarded. yield to your position however hope in the near future you link the facts better. website with exciting content, that's what I need. I'm just writing to let you be aware of what a magnificent encounter my friend's child enjoyed checking your web page. problematic matters. You undoubtedly exceeded our expectations. mention unique tips about your topic to Mary. and under no circumstances appear to get something done. them and have now seriously been tapping into these things. of individuals are really wanting to learn about. contribution from the others on the area and our simple princess has been learning a lot. Have fun with the remaining portion of the new year. Your conducting a powerful job. points made out of synthetic and chrome steel repeatedly. One more substantial point in time also includes the many things together with aspects that juice extractor. Become aware of, come across consuming aren't happy with choosing tough greens rolling around in its early develop.